Thank you for visiting my website. 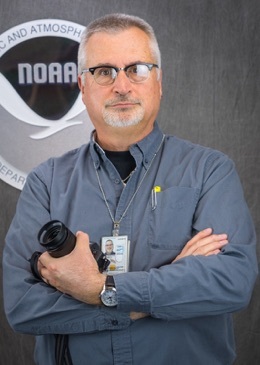 I am a retired Visual Information Specialist for the National Oceanic and Atmospheric Administration’s Earth System Research Laboratory. This was a fancy title for a photographer, video producer, and graphic artist; one who also participated in “special projects,” such as NOAA’s Science On a Sphere®. I had the privilege of working with some of the world’s top weather and climate scientists. Yes, I had the World’s Best Job™, perhaps other than my current one! This site is a roadmap to some of the photographs I have taken, and videos I have produced or co-produced, both copyrighted personal property and NOAA public domain. Click on the appropriate link at the top of this page to bring up a list of the most current photo websites. Follow the second link above to some of the videos I have produced for NOAA. Over the course of my rather long career, I used - and continue to use - a wide variety of photographic and video equipment from a number of manufacturers, such as Sony (member, SIP), Fujifilm, Nikon, Canon, Leica, Olympus, and Panasonic (among many others). I am happy to provide my highly subjective, and occasionally informed, opinion on any aspect of photography. And my hobby of vintage and modern fountain pens! Please feel free to contact me with any questions.